All it takes is two words to have me salivate on demand: “the Keg.” I typically don’t like chain restaurants and if I’m having a sit down dinner with friends, it will likely always be at an independent establishment but all the rules and conceptions are tossed out the window when it comes to the Keg. The steaks are consistently fresh and cooked perfectly. Each bite is dense yet melts in your mouth. Writing this so far has caused a puddle of drool to pool on my iPad. So moving on.. This steak isn’t quite at the level of the Keg (let’s be honest though- what is?) but it does certainly compare and it satisfies a red meat craving if you’re having one. 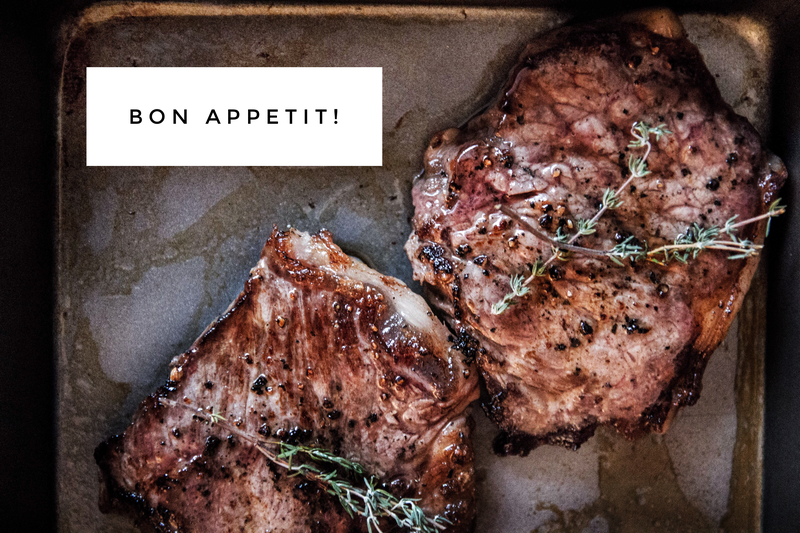 It costs about a fraction of the amount a steak does from a restaurant and finally – my favourite part about this recipe – all you need is a stovetop and oven. No need to get your grill or bbq fired up. In fact, and this may be an unpopular opinion but I stand strongly by it. 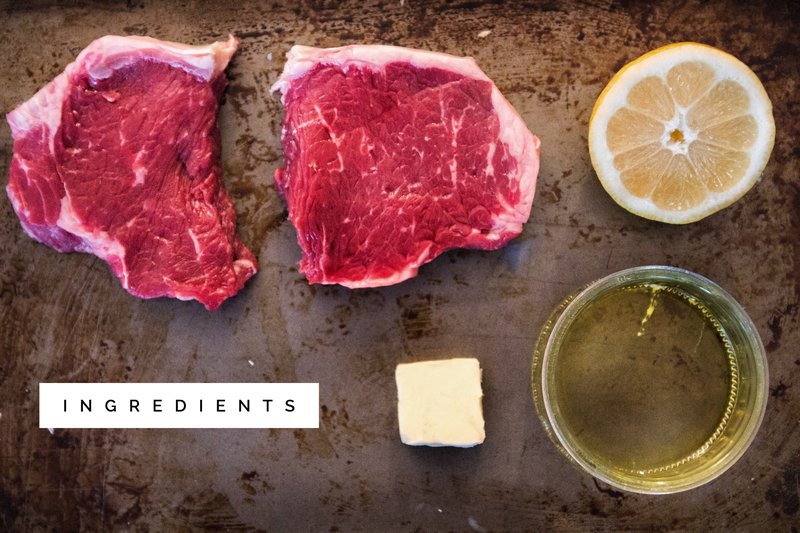 This is the BEST method of cooking steak. The outer layer is crispy and nicely charred and the meat is juicy and flavourful. The combination in my mouth is nothing short of perfect. It takes no time at all and the results are spectacular. Because so few ingredients are used for this recipe, it is imperative that the freshest and top quality ingredients are used, and that procedure is followed accurately. This means fresh black cracked pepper is necessary. Also, using fresh meat from a butcher is ideal. I also used fresh lemons straight from my sisters backyard lemon tree in California – but I don’t expect you to follow suit in this regard. I just got lucky. Squeeze half a lemon over both cuts of meat on both sides. Season generously with salt and freshly cracked pepper on both sides. Melt butter and olive oil in pan on high heat. Let heat for 1-2 minutes but do not let butter burn. Ensure pan is searing hot. Using tongs, safely place each cut of meat on the pan and sear until nice charred (about 4 minutes). Flip the cuts of meat and char on the other side (about four minutes). Using tongs, quickly transfer meat from the pan to a baking pan. 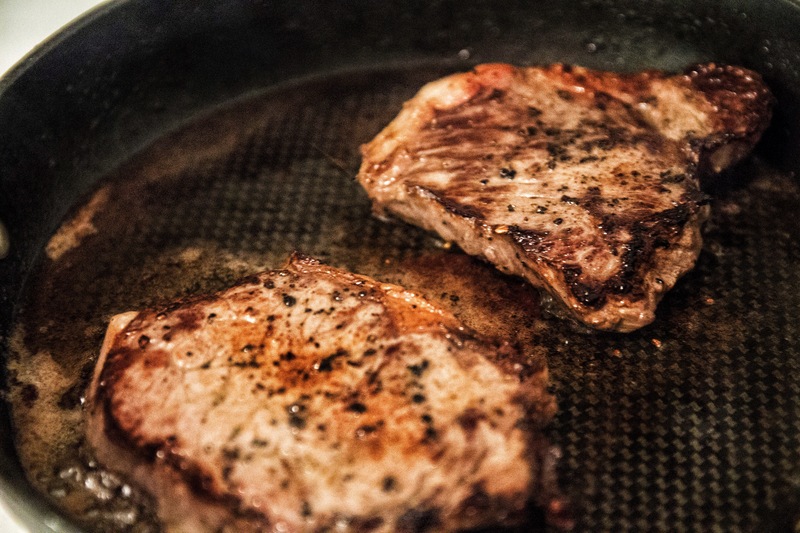 Pour juices from frying pan on top of steaks in baking pan. Depending on your preference, cook meat anywhere from 3 minutes (rare) to 5 minutes (medium rare) to 7 minutes (well done). Based on how thick your steak is and how your oven cooks, this may take some trial and error. Keep an eye on your steak during this time. *Note: If you have a cast iron skillet, you can use it from the stovetop directly to the oven. it will make this simple recipe that much simpler. I unfortunately do not own one. It is on my wish list however! Yummy, I will save this recipice and cook it for my husband !! Yum! 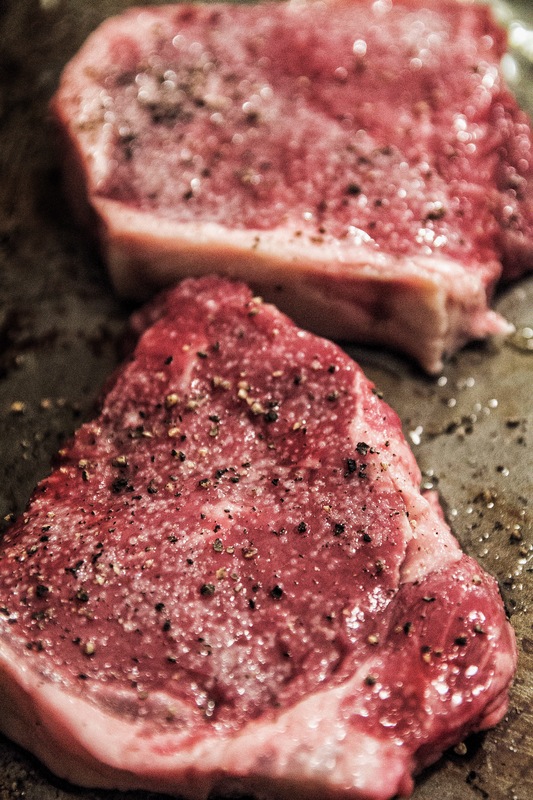 And I couldn’t agree more…this is definitely my favorite method for cooking steaks..the results are unbeatable! I’m so happy you agree! Once you try it out this way, it’s hard to do it any other way. This looks delicious! Looks simple enough for a college kid like me so I think I’ll give it a try! It definitely is! And not a bad upgrade from ramen or mac and cheese either. 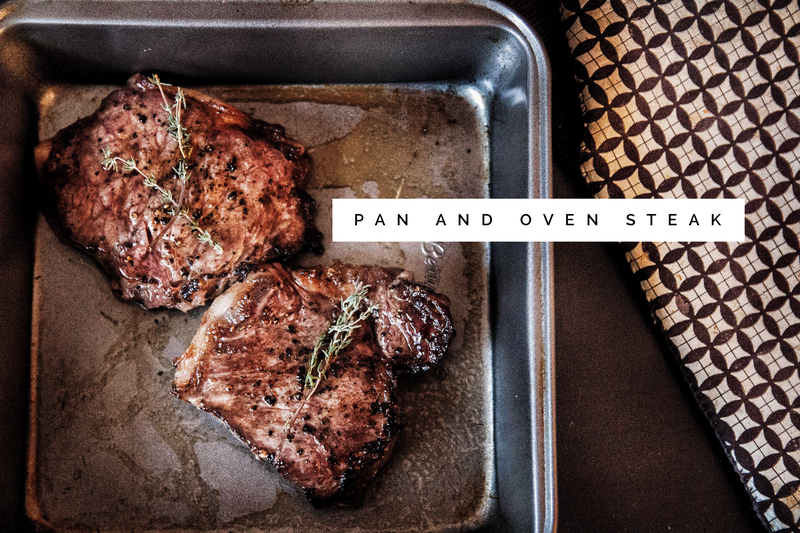 The beauty of the pan is that it leaves the steak nice and seared and gives that delicious charred, mild crunch. But that’s all we really need it for! The oven does a terrific job of letting you control the level to which the steak is cooked for more precisely. Thanks for stopping by!